Milwaukeeans love to despise the city’s public art. From David Middlebrook’s deliberately lopsided Tip in Gordon Park to Gerald P. Sawyer’s Bronze Fonz on the downtown Riverwalk, just about every sculpture in town has its share of detractors. Even in Milwaukee a piece of public art can occasionally resonate with nearly everyone. For example, the sculpture in the above photo was immediately embraced by art critics and the public alike at its unveiling in 1898. According to the Sons of Union Veterans of the Civil War it is the state’s most important Civil War monument of the 19th century and among the finest-ever monuments dedicated to the memory of the Civil War soldier. And if you live in Milwaukee you almost certainly have passed it many times, perhaps without really noticing it. The sculpture is on an island in the center of Wisconsin Avenue, just west of the Central Library. The artist is John S. Conway of Milwaukee, and his sculpture is Victorious Charge. Art critics at the time of the sculpture’s unveiling in 1898 considered it the most artistically sensitive interpretation of the Civil War to date. The ceremony that accompanied its unveiling was also a grand celebration of the 50th anniversary of Wisconsin’s statehood and tens of thousands were in attendance. To understand this artwork, it helps to remember the role Wisconsin soldiers played in the conflict to end slavery and reunite the nation – and the terrible price many of them paid. Wisconsin, admitted to the union just 13 years before the outbreak of the Civil War, provided 91,000 soldiers to the Union cause. More than 12,000 of them died and a far greater number suffered permanent injury or disfigurement. One of the most famous units in the entire war, the “Iron Brigade,” was largely made up of Wisconsinites. Gen. Rufus King was one of its early commanders, and they named a Milwaukee high school after him. The brigade fought some of the bloodiest engagements of the war, including Second Bull Run, Antietam, Fredericksburg, Chancellorsville, Gettysburg, The Wilderness, Petersburg, and Appomattox. It also suffered the highest casualties of any brigade in the Civil War. 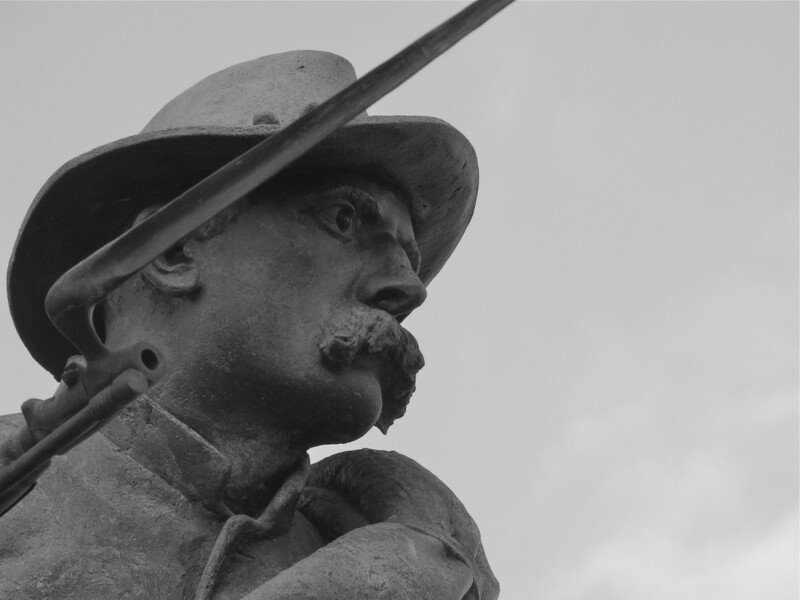 At Gettysburg alone, the brigade sent 1,885 men into action and lost 1,153 killed or wounded in the course of the three-day battle. And the Iron Brigade was just one facet of the state’s involvement in the war. Reminders of it are everywhere. Camp Randall Stadium? Built on the site of the Civil War’s Camp Randall. “On, Wisconsin!” is the state song. It was also the rallying cry of Wisconsin soldiers as they surged forward to meet the Confederates at the Battle of Missionary Ridge. And of course, Sherman, Grant, and Sheridan parks are all named after Union generals. 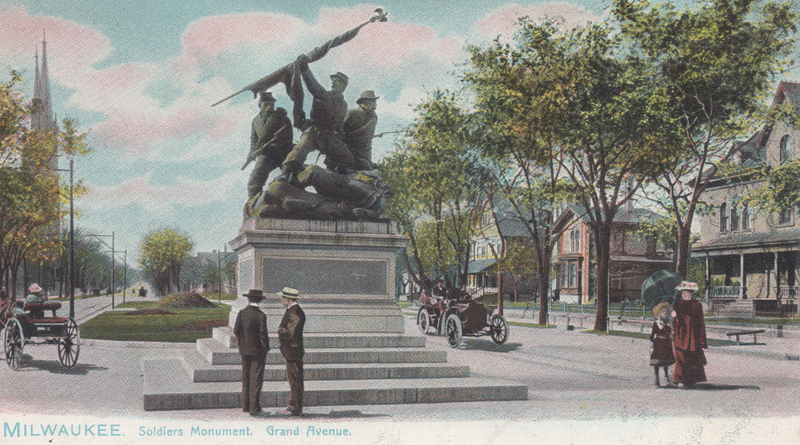 When Milwaukeeans decided to honor Civil War veterans by raising money and commissioning this sculpture, a great many residents could have pointed to a close relative who fought in the conflict, perhaps one who never returned. Emotions must have been running high the day of the Victorious Charge unveiling. 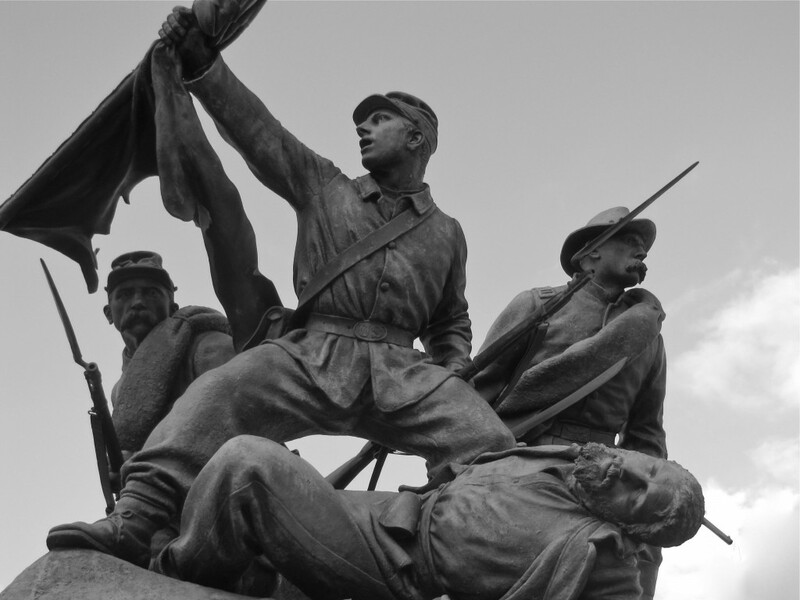 In an era when Civil War monuments were highly romanticized, John Conway opted for a vividly realistic depiction of battle, including a dying soldier in the foreground. 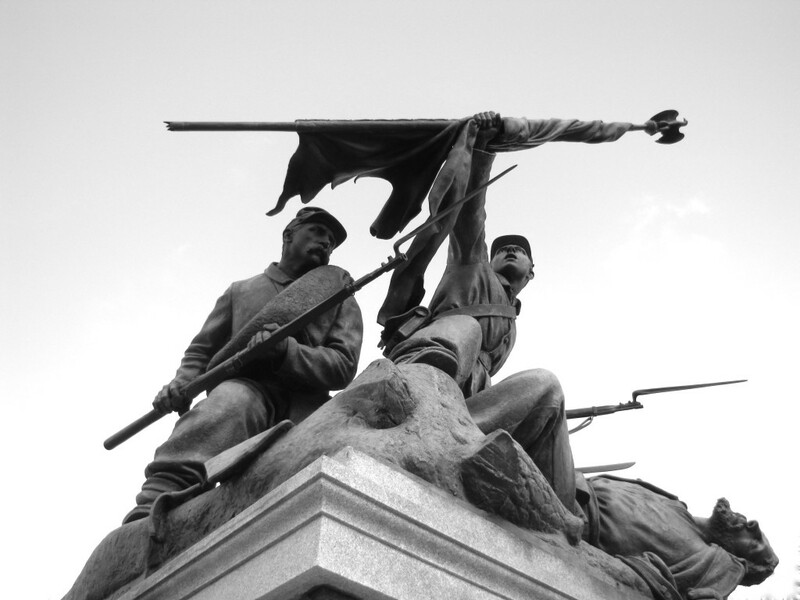 Victorious Charge was instantly hailed as a masterpiece and it remains one of the city’s most important public monuments, although few residents seem to notice its existence. Thank you for pointing out my error. I have corrected the post and I appreciate you taking the time to let me know of the mistake. I need to make a trip for a closer look. Good photo John! Historical Novel Writer Jeff Shaara is writing a 4 book Civil War series featuring the 16th Wisconsin Volunteer regiment. One of the main characters is private Fritz Bauer from Milwaukee. The first three books have been published; A Blaze of Glory, A Chain of Thunder, and The Smoke at Dawn. The sculpture visually describes the battles in each book. Excellent article! Thank you again Carl. I would wish that we could encourage the county or state government to make any repairs needed to clean and refurbish this wonderful historical old monument to it’s former glory again ! . It would be a fitting tribute to all of our soldier’s that served in the many Wisconsin Regiments during that long terrible war . I’ve never seen this statue before but now I’ll have to find it. Interesting that none of the caps worn on the soldiers are Hardee high hats from the famed Iron Brigade.